It’s that time again when you must decide which Canon copier you’re going to buy for your office. When it comes to business technology, it’s essential you understand the costs associated with the office copier your employees need. 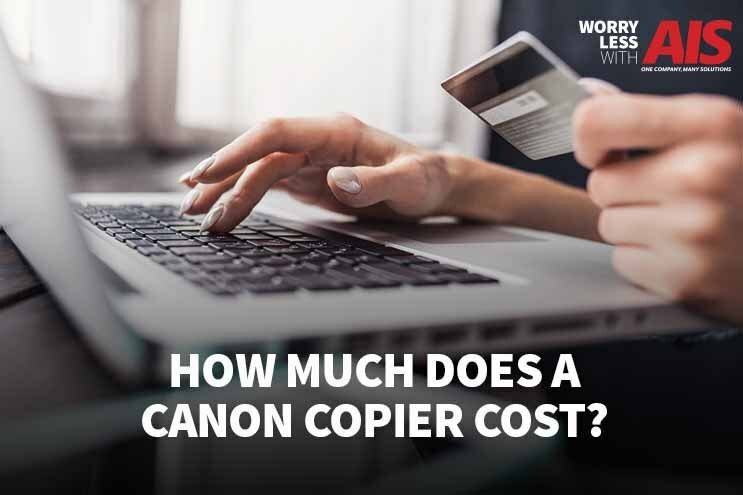 So how much does a Canon Copier really cost? You might not have the time to read Canon copier cost reviews and compare all the different models and machines.Even though this process might feel time-consuming, it’s imperative to do your research. If you’re truly interested in getting a high-quality copier for your business, let us help you!You probably have certain expectations when looking for the best copier. Are you expecting to get the best copier cost and value by trusting the company or service provider you’re paying? To save you time sifting through websites and reviews, we put together some quick tips you can use. This list guides you in selecting the best Canon copier for your business needs, based on price, functionality, and high speeds. We created an easy breakdown of what you can expect to spend on a Canon copier.Also, as a heads up, when you see the abbreviation, “MFP” or the word, “multifunction printer or copier,” think “copier.” An MFP is an all-in-one printer, scanner, copier, and fax machine. Looking for the best copier services provider nearest you? Read our article; I Need a New Copier: How Do I Find The Best One? When you think of Canon products, do you think of a camera? Probably so! However, copiers and printers are also a big part of the Canon manufacturer brand. All Canon copiers are different. Just like any other purchase, you should know exactly what you need out of your office equipment. What’s most important to you when it comes to the copying needs of your office? Just as a reminder, pricing varies on all copier models and dealers. The costs we’re providing for you are average estimates. The Canon imageRUNNER 1435P helps minimize costs and helps ensure dependable operations. This printer ranges in price from $830.00–$1,150.00, with a print speed of 37 pages per minute (ppm). This imageRUNNER has more options than just a black and white laser printer. The imageRUNNER 1435P is small enough to fit on your desktop or a compact space. It can also be used by itself or as part of a larger Canon MFP. If your business has a lower print volume or smaller workgroups, this printer is a pretty good option. If you’re looking for the same desktop printer as the 1435P, but you need color, look no further! The Canon Color imageRUNNER LBP5280 is another option if you’re looking for a compact desktop printer. The price of this printer varies $850.00–$1,300.00, and has a print speed of up to 21 ppm. Whether your needs are basic or more demanding, the imageRUNNER LBP offers a scalable solution to most environments. The Canon imageRunner C3200 is a good option for an office looking for a general MFP color device. This machine has a compact design but, reasonably priced, costing an average of $10,000.00, printing up to 35 ppm. This multi-function printer is ideal for businesses that have higher printing volumes, or even medium-sized business. The Canon imageRUNNER 5065 is made for high-volume printing and copying needs. With a print speed of 65 ppm, this machine can quickly deliver what you need on a day-to-day basis. The average cost of the imageRUNNER 5065 is around $13,000.00. The high capacity paper supply and advanced finishing options allow you to assemble lengthy reports in no time. The Canon imageRUNNER C5185i is your all-in-one multi-function printer, with capabilities of network printing, using scanners and copiers. This MFP can output up to 51 ppm and also gives you the option of double-sided scanning and copying. The average cost for this machine ranges, depending on the features you’re interested in, from $15,000.000–$25,000.00. This piece of office equipment is for heavy-duty jobs. Doing work in-house saves money instead of spending unnecessary money outsourcing. The Canon imageRUNNER 7086 MFP has many features your business can benefit from. Paper folding, booklet finishing, hole-punching, and network connectivity are just some of these features. This device can print up to 86 ppm and can cost anywhere from $20,000.00 to $30,000.00. This MFP is the “mack-daddy” of the Canon printers, and you’d be amazed at all it can do! Are you interested in learning more about office technology and specific points you should be considering? Read an article “Inc.com” published, 6 Questions to Ask Before Buying Office Technology. Like most pieces of technology, there’s always room for upgrades and additional features. Upgrades and add-ons help deliver the specific needs for you and your employees. Technology is growing and changing at a rapid pace. It’s imperative to stay up-to-date on all the features your Canon copier machine can do. Staying up-to-date makes your job easier, while also increasing employee productivity. Take a look at some of these helpful features you can have access to with your Canon copiers. Device and Network Security: Canon offers various protocols and specific security applications for your copier or multi-function printer. You also have the option of IT assistance to help monitor your network security. Keeping your office technology solutions secure (such as wireless servers) is critical in today’s day-in-age. It’s becoming easier for online hackers and cyber-criminals to attack your business. You wouldn’t want your confidential and important information in the hands of a cyber-criminal. Canon Managed Document Services: Have you been looking for a company that helps manage your document solutions? Canon provides value-driven solutions for your small business needs to meet your specific business objectives. Some of these services include service automation, advanced services for document workflow, value-added solutions (such as security), and much more. You want your technology provider to have experience. Highly-qualified professionals help manage your business expectations. Cloud Services: Are you storing your business documents properly? If you’re not backing up your servers to the cloud, it’s time you think about doing so. Canon offers a few different cloud-services options and how these services can best assist your business. uniFLOW Online is a secure cloud-based printing solution for small and medium-sized businesses. uniFLOW helps reduce overall printing costs, increases document security and manages entire print environments. Cloud services are even more vital when you have multiple locations or employees who work remotely. As you can tell, there’s a lot that goes into determining the cost of business technology solutions. To learn more about costs and pricing associated, check out our Office Copy Machine Ultimate Resource Page. AIS wants the best for you, your business, and all of your employees. There’s a lot of technology in the marketplace for you to choose from. The best way to ensure you’re getting the best equipment for your company is by becoming informed. Understanding the needs of your business is a priority. We’re here to educate you with helpful knowledge to help you make great business decisions. Want to know why we represent different copier lines and products? Our goal is to make your office purchasing decisions easy, by exploring common brands on the market. To learn more about office technology and services, reach out to one of our business technology consultants, here. We’re here to give you peace of mind, to help you win more business.